Beijing’s trump card in the trade war between China and the United States has been to slap retaliatory tariffs on U.S. agricultural products, but the Chinese regime’s desire to then increasingly rely on domestic farming may have backfired. Agricultural production in China dipped in the first half of 2018, which had the effect of making goods more expensive for its citizens. On July 6, soybeans, corn, wheat, cotton, rice, and nuts from the U.S. were hit with a 25 percent duties, in response to the Trump administration’s first batch of tariffs on $34 billion worth of Chinese goods. On Sina Weibo, China’s equivalent to Twitter, some Chinese netizens were upset that the public has to foot the bill for the prolonged trade war. “Who is this tariff hurting? Eventually, it is us paying the tariffs and it’s us being sanctioned!” said one user. The drop in agricultural production and the tariffs levied on U.S. imports have resulted in higher prices on consumer goods in China. Though official statistics show that there was a 2.1 percent increase in consumer price index (CPI) in July compared to the same month a year ago, the actual increase may be much greater. Ms. Wu, a resident of Hubei Province, said in an interview with Radio Free Asia (RFA) that local pork prices have increased 25 percent, to 10 yuan ($1.45) per “jin” (a Chinese measure word that is equivalent to 21 ounces) from 8 yuan ($1.16) in May and June. China is the world’s biggest soybean and wheat consumer. It imported about $14 billion worth of soy and $391 million worth of wheat from the United States in 2017. China also buys corn from the United States, importing $160 million worth of corn in 2017. But with the tariffs in place, domestic production hasn’t been enough to meet the demand. Meanwhile, a drought that first hit at the beginning of the year and recently returned is one of the reasons why domestic production in soybeans and corn declined this year compared with a year ago, according to China’s state-run Securities Times. In China, the crops are mostly used to make animal feed and cooking oil. Recently, the corn cobs harvested from many farms in the northeastern cities of Shenyang and Fuxin cities, Liaoning Province, have been affected due to lack of rain. Drought also hit China’s “golden corn belt”—the area of Gongzhuling City in Jilin Province—hard. Feng Jun, a farmer in Liufangzi County in Gongzhuling, told the Securities Times that the region had been in a drought since the beginning of this year. Sufficient rain did not come until the end of May. Feng predicted that annual corn production in the area would drop by 20 to 30 percent, compared with the previous year. Sun Yunting, manager of the agriculture department at Jilin Yuntianhua, a publicly-listed company that manufactures organic fertilizers, agreed with Feng’s ominous prediction in the Securities Times report. The drop in corn yield is reflected in the crop’s futures exchange price. At the Dalian Commodity Exchange based in Liaoning, the corn price (c1901) has increased from about 1,770 yuan (about $256) per ton in April to about 1,883 yuan (about $273) on Aug. 16. In addition to the effects of less than favorable weather, Chinese farmers were less inclined to grow soybeans than corn because of the higher costs, according to the Securities Times. Gao Wenkun, a farmer from Zhuanghe, a county-level city in Liaoning, explained the money spent on buying pesticide would drive up the cost of planting soybeans. According to data from CnGrain.com, a Chinese website dedicated to reporting agricultural news, 115 million acres of agricultural lands is projected to be used for growing soybean in the year 2018, 2 million acres less than a year earlier. The annual soybean yield is expected to stand at 288 million kilograms (about 634 million pounds), 500 million kilograms less (about 11 million pounds) less than a year earlier. Wheat production in China also took a dive in the first half of this year. According to statistics by The State Grain and Reserves Administration, an agency under China’s State Council, wheat yield in the major wheat-producing provinces, including Hebei Province in the north, Jiangsu Province on the eastern coast, Shandong and Anhui provinces in the east, and Henan and Hubei provinces in central China, stood at about 36.9 million tons as of July 31, which was 18.3 million tons less than the amount during this time last year. Henan, one of the largest wheat-producing provinces, saw its wheat production drop from about 17.4 million tons in the first seven months of 2017, to about 7.8 million tons during the same period this year. On Aug. 13, a shipment of 70,000 tons of soybeans worth $23 million landed at the port in Dalian City in northeastern China, becoming the first U.S. soybean cargo to be subjected to China’s retaliatory tariffs, according to Reuters. 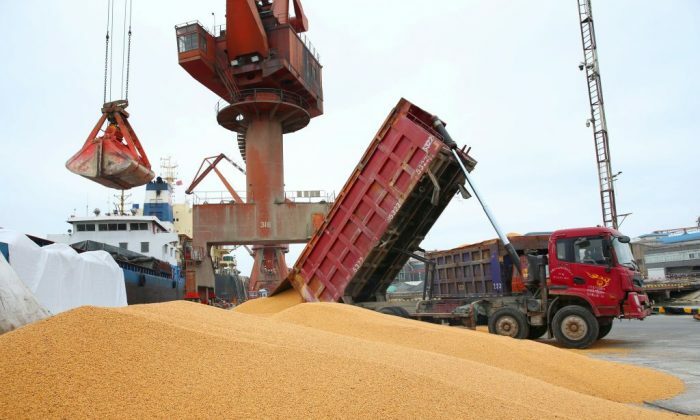 China’s state-run grain stockpiler Sinograin confirmed in a fax to Reuters that it will pay the tariffs, about $6 million, for the shipment. Liu Kaiming, president of The Institute of Contemporary Observation, a labor research nonprofit based in the southern Chinese city of Shenzhen, told RFA that, even though Sinograin paid the tariffs, the higher cost would eventually be shouldered by the public.